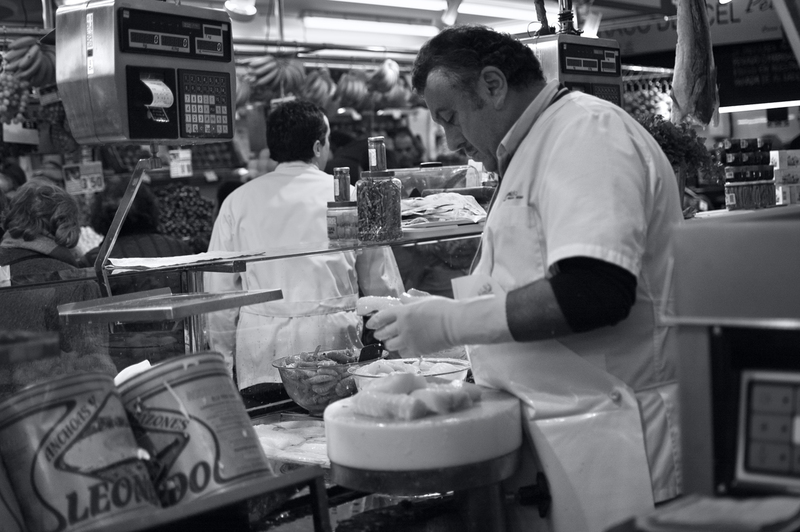 Man preparing cod fish at El Ninot market in Barcelona. With this modest sample of street photography I want to inaugurate this blog where I pretend to concentrate on everyday scenes I shoot in the city. Should you prefer a more eclectic work please browse my complete portfolio at the main site: Barcelona Photoblog. I intend to dedicate the same amount of time to Barcelona Street Photography as I devote to my other blog and I am sure Barcelona has got a lot to give in that sense. I have noticed that although there are plenty of similar websites dedicated to portray our reality there are not so many that clearly state they are about street photography. This is something I love and like to share with you. I hope thanks to this new adventure I find friends with similar interests to give some feedback.